Usually, the combination of cold weather and leftover mashed potatoes inspire me to make a Shepherd’s Pie. Yesterday I had one – the cold weather – but not the other. What I did have was a small piece of seitan and some leftover green beans, and that was enough to get me started. For the potato topping, I microwaved 3 medium-sized potatoes until soft, leaving the skin on. While the potatoes were in the microwave, I chopped some onion and cut a carrot into small dice and sautéed them until soft. I then I chopped the seitan and placed it in the bottom of a baking dish along with the leftover green beans, which I already cut into bite-sized pieces. I added some frozen corn kernels and frozen peas and set it aside to make the sauce. By the time the sauce was made the potatoes were cooked. After coarsely mashing the potatoes with a bit of soy milk, margarine, and salt and pepper, I mixed the sauce into the vegetables and seitan. Then I spooned the mashed potatoes on top and smoothed it out evenly. After sprinkling the snowy top with paprika, I baked it in a preheated 375-degree F. oven for 30 minutes. It was so good that it was hard not to eat the entire casserole between the two of us. We finished up the leftovers for lunch today and enjoyed it all over again. Here’s the basic recipe that I used, but if you don’t have seitan, you can use chopped cooked tempeh, chopped veggie burgers or frozen crumbles, or simply add a cup and a half of cooked chickpeas. 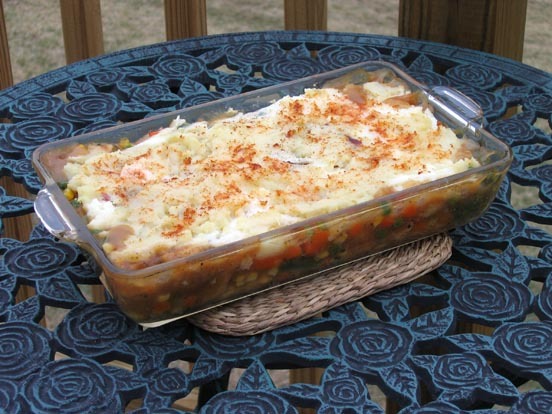 This recipe is an adaptation of Ultimate Shepherd’s Pie in Vegan Planet. Since the sauce can be made while the veggies are cooking and the potatoes are in the microwave, it can be assembled in a very short amount of time. 1. Preheat the oven to 375 degrees F. Microwave the potatoes until tender. 2. Heat the oil in a saucepan over medium heat. Add the onion and carrot. Cover and cook until tender. Set aside. 3. Spread the seitan, green beans (if using), peas, and corn in the bottom of a shallow baking dish. Add the reserved onion and carrot and set aside. 4. Heat the vegetable stock in the same saucepan you used to cook the onion and carrot and bring to a boil. Stir in the tamari, thyme, marjoram, and salt and pepper to taste. Stir in the cornstarch mixture and simmer, stirring, to thicken slightly. 5. Pour the sauce over the filling mixture and set aside. 6. When the potatoes are soft, mash them in a bowl with the soy milk, margarine, and salt and pepper, to taste. Spread the mashed potatoes on top of the casserole and sprinkle with paprika. Bake until hot and bubbly and the top is golden brown, about 30 minutes. Vijita, thanks for your kind words about my books! Be sure to write to me if you have any questions about any of the recipes. By the way, I posted a corrections page on my website to address typos found in VP (it happens!) Also FYI, Vegan Fire & Spice is not yet available in bookstores. You can order it on Amazon or through my website at http://www.robinrobertson.com at a 20% discount. Another option is to ask your local independent bookstore to contact us about carrying a few copies in their store. Thanks. I love when things just fall into place like that. Sometimes, I am so glad to have the cool weather, because a good (vegan) shepherdesses pie, I can not resist! Looks good! And easy… just how I like it these days.